Thirty-one members from the Carolina Chapter and several from the Florida group embarked on the historic floating museum: USS Yorktown in Charleston SC. Some volunteers traveled hundreds of miles to dust off those skills from their former flight deck experiences and expertise. “It’s amazing! I have not touched an aircraft in 30 years. Heck, I have not stepped on a flight deck in 30 years. Standing up here with the wind in my face and that ever so familiar naval-vessel smell just took me back to a much simpler time and place. I want to thank the Flight Deck Veterans Group and USS Yorktown for allowing me to take a step back, if only for the weekend,” one volunteer said. 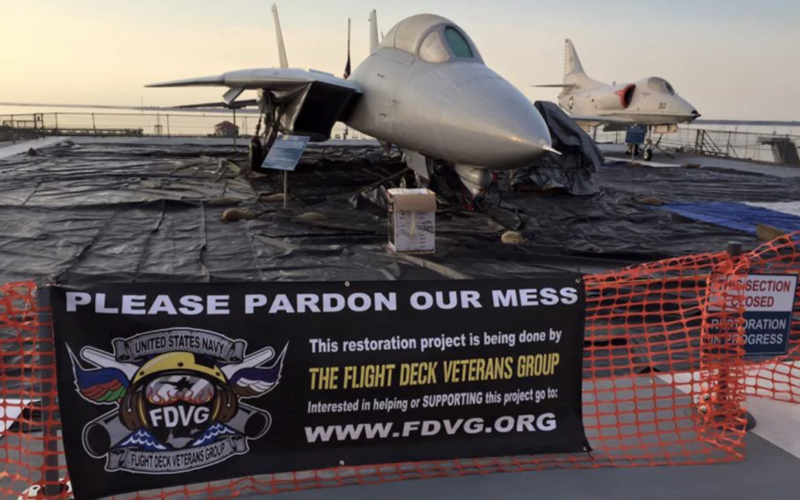 The USS Yorktown F-14 restoration project is scheduled to last through April with plans for a ceremonial unveiling on April 16, 2016. VOLUNTEERS NEEDED! If you would like to participate in this project, please email mdeacon@fdvg.org for information. Members are traveling from all over the country in order to help so don’t miss this opportunity to use those old skills. We need you!